Well I just went to visit our new puppy this evening, and am going to go get him tomorrow and bring him home! I was in town shopping and stocking up on all the puppy goods, and since I was in the area I got to go see him for a bit. It just made me all the more excited to get him and begin our new adventure and lives together! I’m working tomorrow so I figured I’ll pick him up after that, so I won’t be leaving him home alone his first morning here. That wouldn’t be very nice of me. I hope he’ll adapt well, as he won’t have mama or his 10 brothers and sisters around to play with. I am glad I don’t work 5 days/wk, 8-9 hr days, I would hate to leave him home alone that much. We probably wouldn’t be getting one of these guys if I did work full time, they do not do well cooped up in a kennel all day without people and without exercise. 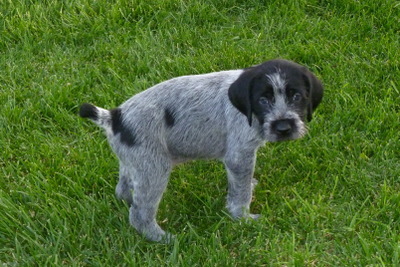 So I have been, and am, perusing the web, reading about German Wirehair Pointers. Will has always been more familiar with these pointer breeds and has wanted one for a long time now, whereas I am more familiar with little lap/toy dogs like my two little Pomeranians that my family and I had for 15+ years. So I’m reading up and we have both been reading this book, Gun Dog, by Richard Wolters. Seems to be a classic and well-known among bird-dog owners. Very informative and good guidance for training and having these dogs. The more I learn about them the more awesome they are. We are still back and forth on the name. The breeders are calling him Colonel. He has some black/grey markings around his tail which look like a ring around it, and I guess a dog with those markings on the tail can be called ‘Colonel’ or ‘Sargent’ among people who know this breed. 🙂 So as of now he is Colonel Jack (short for Jackson). Well more to come on the little guy soon! Is soon to be adopted and brought home! He is 46 days old right now, the puppies have to be with mama for 49 days so we’ll be going to get him and bring him to his new home and family soon. What will we call him? He is Waylon. We have been back and forth between Waylon, and Jackson. We like both, so might just put Waylon Jackson on his papers, and call him one or the other. In that case, he’ll have the same initials as Will. =) WJW. I will have pictures of our little guy soon and an update on his transition. I’m off to go looking for doggie items that we need to have here at home in order to bring him home! A kennel, leash, collar, dish, rope toy, bed for the living room, and food. Leave me a comment if you have any thoughts and opinions on the name. I’d love to hear!